Getting a good night’s sleep can start your day off in a way that will extend your mood pleasant and your body feeling physically good all day. Conversely, without that good night’s sleep you may find your body sore and your mood deteriorating all day long. There are so many contributing factors to sleeping well that you may get boggled down by one or another and neglect to address one of the most simple components. Finding a supportive pillow that will allow you to get the rest you need in a position that will chase your body’s aches and pains away is absolutely crucial. A memory foam pillow may be just what you need to achieve that goal and if you’re lost on the why or which pillow is best for you, no need to worry. We’ve done your homework for you. We reviewed dozens of memory foam pillows to identify the best of the best. We looked at contoured pillows and shredded memory foam pillows. No matter if you sleep on your side or your back or a combination of each, we’ve found the best of these pillow types and more. For the best memory foam pillow on the market, look no further than the Coop Home Goods Premium Adjustable Loft Hypoallergenic Memory Foam Pillow. From early on in our research, the Coop Home Goods Premium Memory Foam Pillow stood out as a clear winner for our choice as top pick. Not only will you love the longevity of this shredded memory foam pillow, you’ll love that for the entirety of its use, you won’t need to worry about allergens keeping you up all night. The Coop Home Goods Memory Foam Pillow has a removable, machine washable cover and is made with premium, adjustable loft and a two-way stretch inner liner for maximum mold-ability so you can fine-tune it to perfectly support your head and neck for a comfortable night’s sleep. This pillow comes with a guarantee of five years without going flat. This pillow has a 100-night trial that makes it a virtually risk-free purchase. If, after 100 nights of sleeping with this pillow, you decide you don’t like it, you can send it back for a full refund. And the manufacturer will go even further than that: if you try it and find it’s too fluffy, too flat, not fluffy enough – you can add or remove fill, a proprietary blend of shredded visco elastic memory foam, to make it just perfect for you. The overall rating of this pillow is 4.3, which is a good, solid rating for any product. But this pillow has over 15,000 customer reviews on Amazon giving it that rating. It’s safe to say that with that many people, this isn’t a matter of opinion, it’s just a fact: This is an excellent pillow. Control the comfort of your pillow by adding or taking away as mush shredded memory foam as you’d like with the Xtreme Comforts Hypoallergenic Memory Foam Pillow. 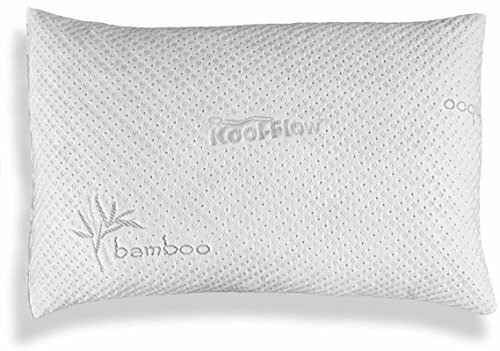 The bamboo cover for this pillow is removable and also machine washable (don’t wash the cover still on the pillow) and is micro-vented to add a bit more ventilation and keep you cool while you sleep. With this pillow case, your body’s heat will be absorbed by the memory foam, softening it but the pillow case will keep your face cool. There’s well over 2,500 customer reviews on Amazon earning this pillow an overall rating of 4.2. That’s plenty enough to tempt us, but if you need more, the standard-sized pillow is just under $50 – not too bad! 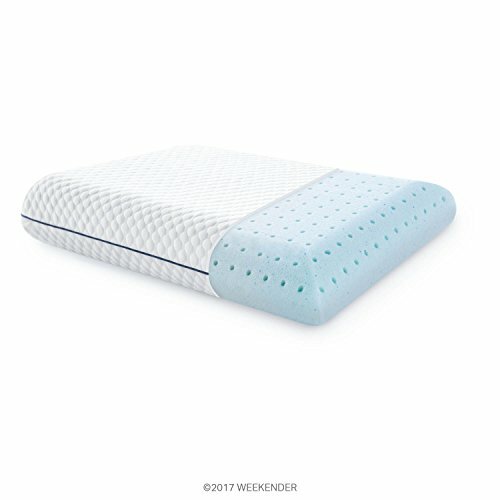 For a memory foam pillow that will let you sink into its comfort and not into a financial sinkhole, try the WEEKENDER Ventilated Gel Memory Foam Pillow. The WEEKENDER Ventilated Gel Memory Foam Pillow is a solid, one piece memory foam pillow that won’t need (and can’t be) fluffed and re-positioned. You will sink into this pillow with relaxing warmth as your body’s heat softens the foam over time, making it all the more comfortable. 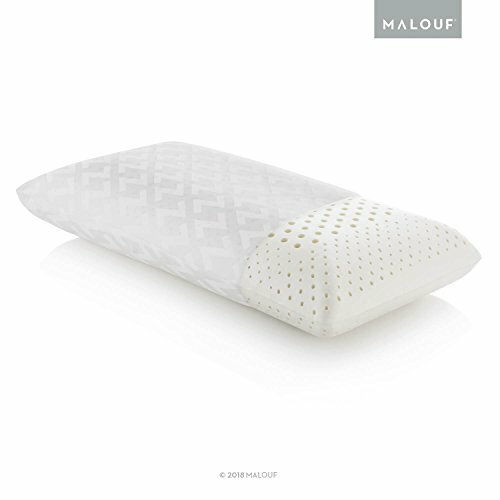 The pillow is ventilated with several holes along the surface and the foam is infused with a cooling gel to make sure that you won’t become overheated as the pillow warms and softens. The case that comes with this pillow zips close so you won’t need to worry about it slipping off in the night. It’s also machine washable and ultra soft. And if you aren’t crazy about the appearance, you can pop your own pillow case over top without any problem whatsoever. This pillow is nearing 1,000 customer reviews on Amazon and has a more than respectable overall rating of 4.2 stars. And if that’s not enough to convince you, take a look at the price tag: you can pick up one of the standard sized pillows for $30- what a steal! For a pillow that will fit a king bed, but is also fit for a king, pick up a Z Zoned Dough Memory Foam Pillow. If you’ve never purchased a memory foam pillow before, the Z Zoned Dough Memory Foam Pillow may have you looking up “what is a pillow’s loft?” You won’t need to now, though. The ‘loft’ refers to the height of the pillow while it’s lying flat on your bed. It’s a lot like height, but for a pillow, that just doesn’t seem an accurate enough description. A high loft will be an extra thick pillow and a low loft will be thinner. This pillow is marketed as “zoned for breathability and neck support” meaning it has the ventilation holes cut into the pillow very precisely so as to still offer support to the areas that need it (I.E. your neck) and use other areas on the pillow’s surface for the ventilation holes that will keep you breathing and cool. And to go hand-in-hand with that idea is the Tencel cover for this pillow that will help keep you cool all through the night. With well over 500 customer reviews on Amazon, this pillow has earned an overall rating of 4.1 star. That’s plenty enough people throwing in their support to suggest this is a pillow that will keep you happy. If you want to make sure you’re maintaining an ergonomic position to support your neck and shoulders, even while you sleep, you’ll want to take a look at the EPABO Contour Memory Foam Orthopedic Sleeping Pillow. 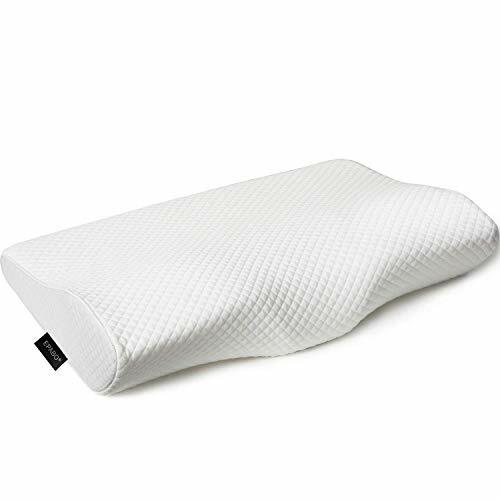 The EPABO Contour Memory Foam Orthopedic Sleeping Pillow has a natural curve that will cradle your head and neck, giving you the support you need to maintain an ergonomic position all through your sleep. Such position may contribute so thoroughly to your comfort that it allows you to fall asleep faster. The contour of the pillow gives your neck a specific divot to fall into and a slope that extends from one side of the pillow to the other, making sure your neck is getting full support and your neck is not bent while you sleep. The removable pillow case that is custom fitted to this pillow is a proprietary blend of rayon, polyester, and bamboo fibers that will offer you maximum comfort while maintaining a temperature that won’t overheat you. It has its own zipper, but it also conceals the cover of the foam itself; both covers are machine washable so you’ll be able to clean up anything those covers catch. This pillow has around 300 customer reviews on Amazon, earning it an overall rating of 4.3 stars. That’s definitely indicates this pillow will help you get a good nights sleep; and you’ll be doing it for right around $45. A memory foam pillow is going to help you sleep better. You’ll have a more aligned spine and your body will spend the whole night of sleep with the pressure evenly spread throughout without pushing more on one spot than another; just as is intended for your body. This will keep your aches and pains away the next day and being in that ergonomic position for the duration of your sleep will help with your breathing, too. Breathing properly each night can keep you from developing sleep apnea and your snoring will be at a minimum, as well. – Something any partner in your bed will greatly appreciate. If you’re particularly sensitive to allergens, a memory foam pillow may be a good option for you, as well. Dense memory foam is considered hypoallergenic because it inhibits the growth of the bacteria, fungus, mold, and dust mites that commonly collect in your pillow. In fact, even if these don’t cause any allergic reactions, you have to admit, sharing your pillow with other living organisms isn’t exactly appealing. Anything that will minimize the overall gross factor of a pillow, we fully support. You will still need to replace the pillow due to your body’s sweat, your hair’s oils and other various particles, but those are not nearly as harmful to breath in or to sleep on top of, so you won’t need to replace your pillow nearly as often; which is good because the memory foam will maintain its shape for years. Contoured. If the pillow you’re sleeping on is already pre-formed to be the most ergonomically positioned, then you’re saving yourself a lot of guesswork and a bit of time. You won’t need to wonder if your pillow is fluffed to support your neck properly or if it’s putting strain on you back if it’s already cut and contoured to set your body to rights. And while you may not be used to the level of comfort it gives you right away (it may not feel comfortable at all, in fact), you will be forcing yourself to stay in a safe and healthy position for your body. You won’t even have the opportunity to re-position it; after all, just because a fluffed up pillow is comfortable doesn’t mean it’s best for you. You may love to sleep with a whole stack of pillows, but that just isn’t good for you. Shredded. A shredded memory foam pillow will allow you to snuggle into your pillow like a traditional pillow. It will still give you the support and comfort of a memory foam pillow, though so you won’t need to worry as much about putting yourself in an unsafe position. These pillows also maintain their shape a bit longer because there are so many individual pieces that they don’t flatten at the same pace like a solid piece will. This is a wonderful pillow if you’re not quite sold on the idea of a memory foam pillow and want a bit of fluffing freedom. Plus, without solid foam, you’ll get a bit more air into the pillow making it cooler and more properly ventilated. It’s also the most likely to be machine washable and that’s an ‘easy’ button you’ll adore. Cooling/gel. Foam is incredibly beneficial for your sleep and as such, has been increasingly popular in both mattresses and pillows. But for all its benefits, foam is notoriously warm. It absorbs your body heat and because it is so dense, it will trap that heat inside it, keeping you warm, too. Countering that effect can be as easy as getting a bamboo pillow case that will keep the pillow cooler, or as thorough as finding a pillow with a gel pad built into it. If you know you’re a “hot sleeper” you may want to avoid waiting to see and just grab one of the gel memory foam pillows from the start, but if you’re in doubt, keep in mind that all can be purchased and added later. But keep in mind the entire point of the memory foam pillow is that it absorbs your body heat and doing so makes it softer. That’s what it’s supposed to do; it’s by design. Side or back sleepers. A contoured pillow is perfect for either side or back sleepers, but you may personally find them less comfortable for one or the other. If that’s the case, then you may prefer either a solid, ventilated, or shredded pillow. Unfortunately, (or maybe fortunately) you won’t know which you’ll like more without trying it; side and back sleeping pillows are pretty closely designed and the chances are a toss up which are going to suit you best. There is one definite when it comes to sleeping style: if you’re a stomach sleeper, a memory foam pillow is not for you. (Although, stomach sleeping is not good for your body anyways, so you may want to just look into getting ahead of any future pain you’re going to suffer stuck in that position.) Pregnant women who need extra support for catching some Z’s should also check out our review of the best pregnancy pillows. If used properly, memory foam pillows will give your body the support it needs to keep you from waking up with a twinged neck, sore muscles, or misaligned back. In theory, with a memory foam pillow you shouldn’t ever have to wake up to say “I slept wrong” and need to go about your day in pain. A memory foam pillow will mold to the shape of your head and give the support you’ll need to prevent your neck from bending. That will allow your spine to remain aligned properly and keep you from inadvertently hurting yourself while you sleep. How do you sleep with a memory foam pillow? If you have a contoured memory foam pillow, you’ll want to sleep on with the larger curve down – closest to the foot of the bed that is. The larger curve will keep your neck supported and prevent you from forcing your chin to your chest. You can sleep on either your back or your side for the contoured memory foam pillow, as that larger contour is enough to keep your back or shoulder from undue pressure. Once lying down, give it time. Your pillow may seem too firm at first, but as it warms with your body it will soften. If your memory foam pillow is shredded, then you’ll sleep on it just as any other; there’s nothing special about strategy there. For solid memory foam pillows, you’ll do the same with special interest in not sleeping on your stomach. How long can you keep a memory foam pillow? We suspect this question is asked much more often than, “How long can you keep a standard pillow?” for the simple fact that pillows with standard filling will go flat and be uncomfortable long before it’s time to get a new one. That being said, just because your pillow maintains its shape and remains comfortable doesn’t mean you should necessarily keep it. In fact, the trick of “replace your pillow when it doesn’t bounce back when folded in half” is almost completely useless for a memory foam pillow. It’s going to pass that test for years and years – years where oils from your hair and skin, shed skin and more will collect. Whereas a polyester pillow should be replaced every 6 months, you can certainly get away with longer from a memory foam pillow. But you should still replace it every 18 – 36 months at most. 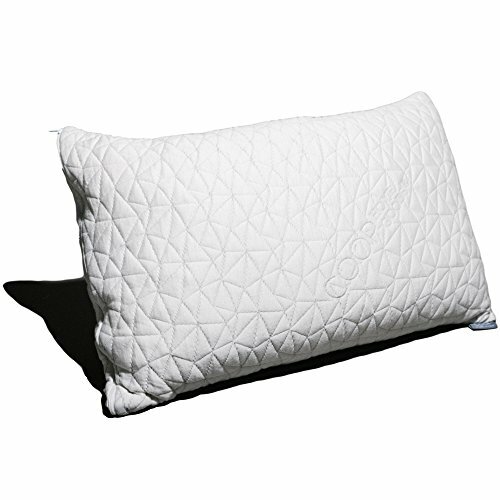 The center of this pillow is ideal for back sleepers while each side is perfect for giving neck support to side sleepers. The memory foam of this pillow is a light yellow color, denoting the foam is the original color and not bleached. This contoured memory foam pillow won’t put off an unpleasant odor, so you won’t need to “air it out” before you sleep on it. This pillow works just as well for side sleepers as it does for back sleepers, so if you toss and turn – you’re still covered. Not only does this pillow have a warranty, the manufacturer also gives you 96 nights as a sleep trial; if you aren’t satisfied, you can return it for a full refund. This solid memory foam pillow has air ventilation built into it so you won’t get overheated. The cooling gel pad is part of the pillow and it comes with a hypoallergenic performance mesh knit cover for even more cooling comfort. True, this pillow definitely falls into the “Contoured” category also, but with as much effort they put into designing this pillow to be cool, it seemed more appropriate to list it in the cooling and gel category. This memory foam is made with the manufacturer’s Hyperfoam, a gel-infused, extra dense, proprietary foam that will keep you comfortable and cool. If you’re in the habit of flipping your pillow in the night to get a “new” cool side pushed to your face, this dual-sided cooling pillow is right up your alley. This pillow has a plush stretch knit cover that will fit the pillow like a glove. This pillow is made with an air-infused memory foam that will give you multiple levels of ventilation to keep you cool throughout the night. This “space-pillow” uses a patent pending lightweight zero gravity foam that is five times more responsive than other memory foams. This pillow is from the manufacturer that is most known for its memory foam products, so you can trust they know what they’re doing. The wave-flow cooling gel covers 30% more of the pillow top than its competitors, making sure you stay cool all night. This is a 2-pack of pillows made without ozone depleters, PBDEs, TDCPP, TCEP flame retardants, mercury, lead or heavy metals, formaldehyde, phthalates regulated by the CPSC, or CFCs – so even the most environmentally conscious will appreciate these pillows. This is a purchase that will give you not one, but two high loft and ultra lush memory foam pillows. Not only is this pillow stuffed with shredded memory foam, but it’s covered in a thick pillow case that is also made with memory foam. With this listing, you can buy one pillow or save a bit of cash and opt for the 2-pack. Because this pillow is securely closed with a zipper, you’ll be able to adjust your pillow’s thickness to get your best sleep.